Save the Date! Free MixFest Concert on Saturday, September 14, 2013! Save the date for the annual MixFest 2013! 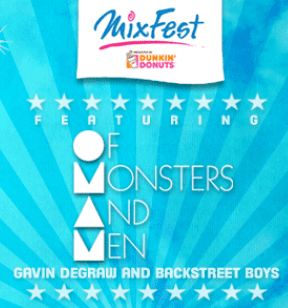 MixFest is a free concert at the Hatch Shell on Saturday, September 14, 2013 featuring Of Monsters and Men, Gavin DeGraw and the Backstreet Boys thanks to Mix 401.1! The gate will open at 1pm, and the music will start at 4pm. For more information, please visit here or to enter to win VIP Passes from Mix 401.1 please head here. WOOP WOOP! please let me win VIP passes! id kill to meet Gavin Degraw!!!! and thank you so much for the free experience!